Father Emmanuel at the piano. Father Emmanuel entered the monastic community in 1983. And for over twenty years he worked at The Holy Rood Guild, our liturgical vestment industry. 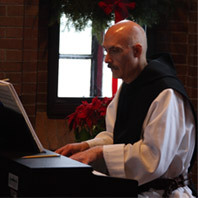 He presently serves as the Abbey’s guestmaster and music director. He is a gifted artist and photographer. Devoted to the Rule of Saint Benedict, our Cistercian charism and our community, Emmanuel says that the contemplative life is part of his identity and what drew him to the monastery. He experiences the monastic day as sanctified with prayer and mindfulness of God and treasures the celebration of the liturgy, especially the Liturgy of the Hours. Photographs in this slideshow as well as many thought our website were captured by Father Emmanuel.